Former Belfast Celt Paddy O'Connell features in an new hour long Irish television documentary on TG4. Marked in football history as the man who saved Barcelona during the Spanish Civil War, Dubliner Paddy’s life and times are remembered in the programme, titled Paddy Don Patricio. Made by Belfast production company Tobar, the documentary team visited the Belfast Celtic museum, filming there while conducting a wealth of research which uncovered a treasure trove of new information, pictures and even people who knew the man himself during his time in Spain. Paddy’s grandson Mike O'Connell is a featured contributor and pays an amazingly passionate and balanced tribute to his grandfather, in the company of popular Belfast actor and broadcaster Tony Devlin. Mike’s wife Sue, has also just written a book about Paddy’s life and makes a major contribution to the programme. Film Producer Gráinne McElwain said: “When you consider what Paddy O’Connell has achieved in his sporting life, it's incredible. He was born in Dublin, played football with Belfast Celtic and then went on to play and captain Manchester United during World War One, before being appointed manager of one of the most famous European Clubs of all time, FC Barcelona, and also helped save that club from falling into the hands of Franco during the Spanish Civil War." Presenter Tony Devlin believes, "Although they went out of business over 60 years ago, Belfast Celtic is still alive and well in the memories of lots of people." "As a Belfast man and a Celtic supporter, it is a great honour for me to tell the tale of one of its finest players. Belfast Celtic was where Paddy O'Connell would ply his trade before coming to the attention of two of the worlds biggest footballing names, Man Utd and Barcelona." "This man's incredible story takes us on a journey from lowly, humble beginnings to football stardom, to heroism and bravery in his fight against facism during the Spanish civil war." " Stories like Paddy O'Connell's cannot be lost in the annals of history." To find out more about Tobar Productions, click online at www.tobarproductions.com. 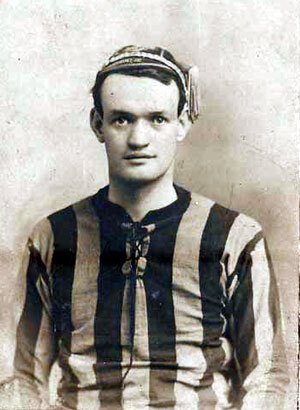 You can also read more about Don Patricio in the Galway Advertiser newspaper article and on the Belfast Celtic website.